Wow! Talk about being in the right place at the right time! 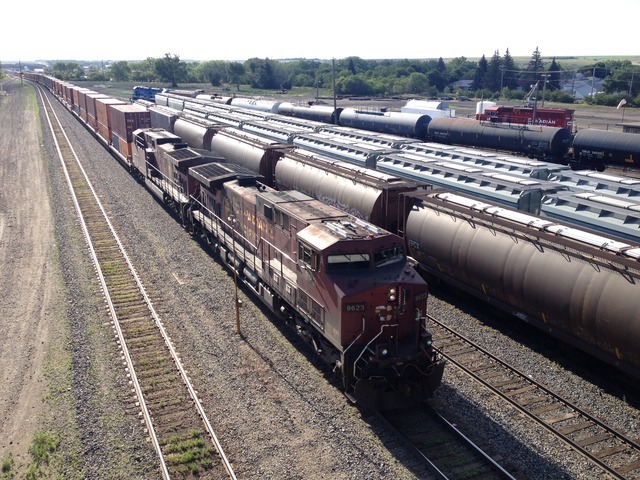 Long time WMRC member and intrepid railfan correspondent Felix Lesiuk took these images of the CP train wreck near Rosser shortly after it happened, and he dispatched them to us pronto! "I was coming back from the farm this afternoon around supper time and just came upon a derailment of an Eastbound CP stack train." Said Felix. "A storm cell had blown the train onto the north side of the tracks. This happened about 20 minutes before I got there between the town of Rosser and the Rosser grain elevator. Luckily, I wasn't there as it happened. There was a Manitoba storm chaser car driving around so I suppose it was following the storm." "I took a bunch of pictures from my window as I drove slowly by. When I got to the end the sun came out so I doubled back to get some pictures in the sun. When I was leaving the emergency response team closed the highway after me. The irony for CP is that they just replaced that section of rail with new track last month." There was no stopping this little tyke from seeing the trains at the Gateway Western Railway! The Winnipeg Railway Museum had a very good turnout during Doors Open Winnipeg this past weekend. Dedicated WMRC volunteers ran the Gateway Western Railway while WMRC Program Director Dave Downie operated the club's John Allen Timesaver modular switch yard. The Timesaver's power pack burnt out on Saturday, but Gateway Western Superintendent Gino Kost supplied another power pack that carried it through the weekend. Much appreciated, Gino! Many of the kids did a great job running the Timesaver (both boys and girls). The club printed out completion certificates which were to be given to the kids for successfully operating the Timesaver layout. Unfortunately, most of the kids weren't interested in them, and neither were their parents. Dave spoke to many people who expressed an interest in the WMRC and The Manitoba Mega Train Show and many brochures were handed out for both. The Winnipeg Railway Museum did a great job supplying a table and an electrical hookup. Thanks to everyone who helped out! WMRC Program Director Dave Downie (left) is seen working the John Allen Timesaver modular switching layout with Gatweay Western Railway Superintendent Gino Kost during the club's open house in April. The Timesaver was a big hit at the Winnipeg Railway Museum during Doors Open Winnipeg this past weekend. It's time again for Doors Open Winnipeg! The Winnipeg Railway Museum will be participating again, and the Winnipeg Model Railroad Club will have the Gateway Western Railway up and running! The Gateway is open to the general public only twice a year, so make sure to grab this opportunity to view Manitoba's largest operating model railway in action! As a special bonus this year, WMRC program director Dave Downie will have the club's John Allen Timesaver running as well! The time saver is a portable interactive switch yard that you can operate! See how fast you can shunt freight cars to their destination! The Timesaver was such a big hit at our open house in April, and we're bringing it back by popular demand! The Winnipeg Railway Museum is located at the second level of the Via Rail Station at 123 Main Street. The museum is open during Doors Open Winnipeg from 11:00AM to 5:00PM on Saturday, May 26 and Sunday, May 27. Hope to see you all there! If you do a Bing search for the Winnipeg Model Railroad Club, this blog shows up first. Our Facebook link shows up third, and second place is Global News Morning Winnipeg's interview with WMRC Secretary Marvin Fetch! It was broadcast on Friday, April 6 to promote our annual spring train show and open house, which took place on April 7 and 8. 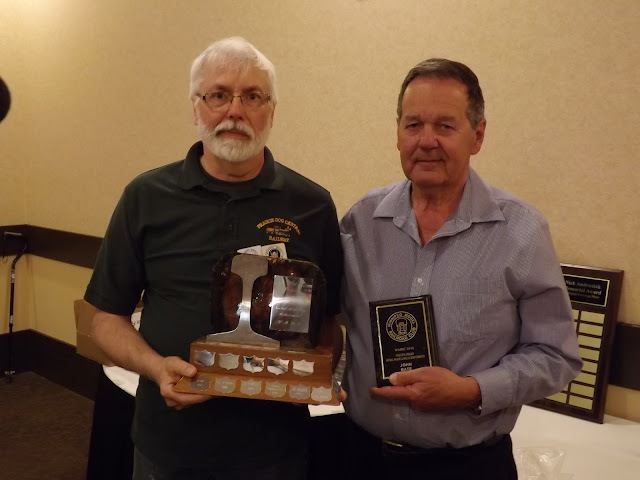 WMRC President Bob Harrison presents the President's Shield award to former WMRC President Larry Leavens at the annual WMRC banquet held on Friday, May 11 at the CanAd Inns Polo Park. 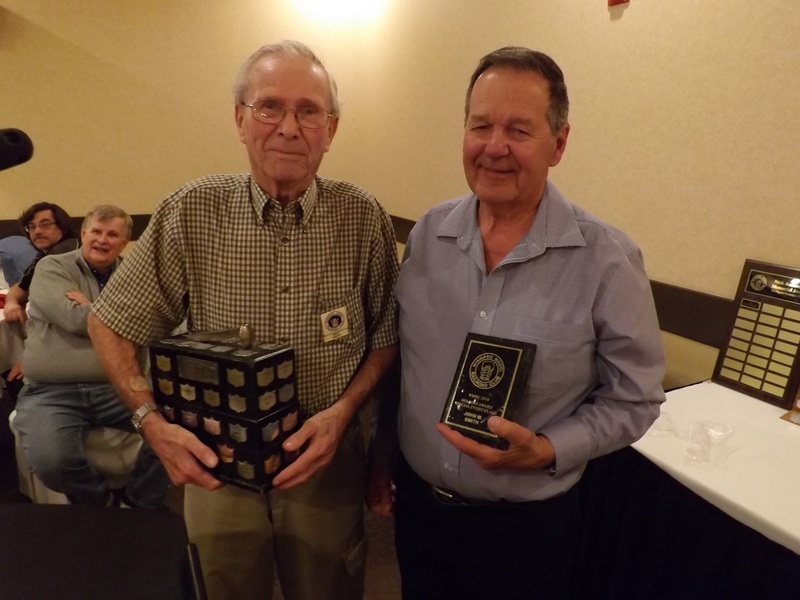 Fun times were to be had at the WMRC's 2018 annual banquet, held at the CanAd Inns Polo Park on Friday, May 11, 2018. After enjoying a great buffet meal at Aalto's, several awards were given out and lots of prizes were won for our "arms length" raffle, the elimination draw and our door prizes! It's always a great way to end the model railroad season, and after we all have an enjoyable summer of rail fanning, we're all looking forward seeing everyone again at our next meeting in September! 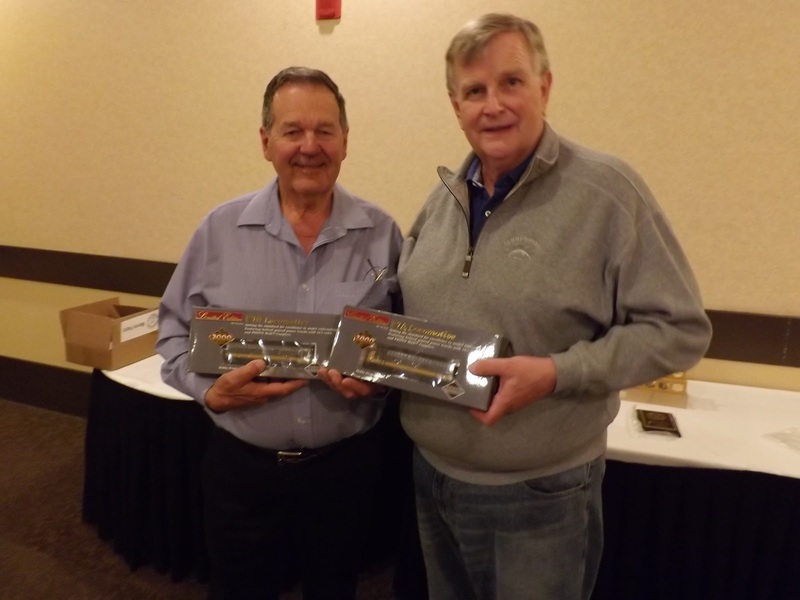 WMRC secretary Marvin Fetch and President Bob Harrison show off the two HO locomotives that were given away at the elimination draw. Veteran WMRC member and NMRA Master Model Railroader Moe Smith is seen with WMRC Secretary Marvin Fetch as he is presented with the Holman award - special event class for his superb modelling work. 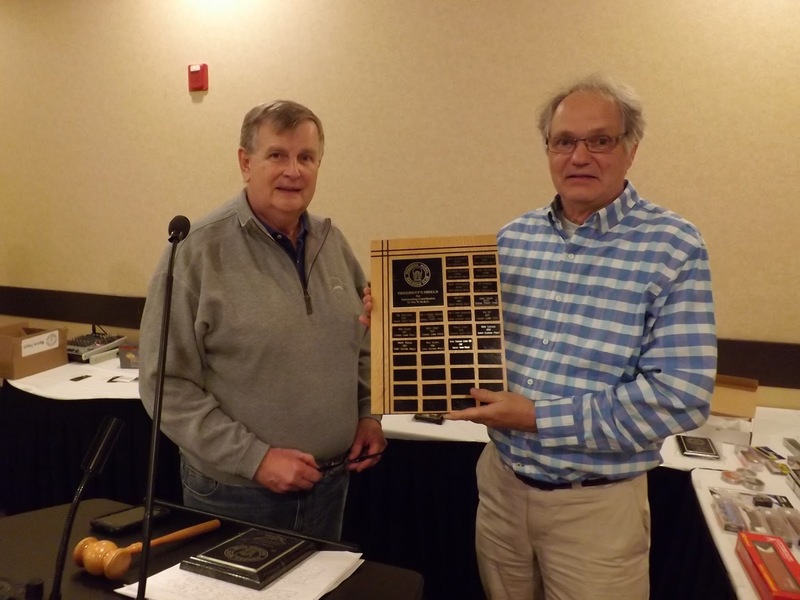 WMRC Treasurer John Bate is presented with the 2018 Friesen award for initial modelling achievement by WMRC Secretary John Bate. The WMRC is winding up another great season with our annual banquet! We'll also be holding our annual general meeting and presenting awards to the winners of our photo and model contests. 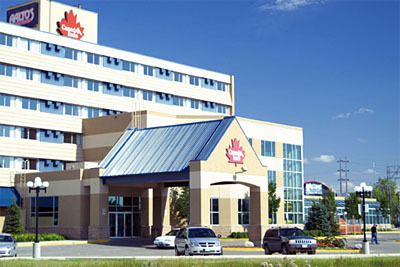 It's being held on Friday, May 11, at the Canad Inns Polo Park in Alto's Restaurant, which is located at 1405 St. Matthews Avenue. Cocktails and dinner (buffet style or order from their menu) will start at 6:00PM, and the AGM will begin at 7:30PM. We’ll have lots of door prizes and “arm's length” raffle ticket prizes (that’s where you buy your arm’s length of tickets) to give out, as well as our traditional elimination draw! Hope to see you all there!